In this article, I will share an opportunity where you can start your own home based business using Shiruto as one of your main product. Belixz Shiruto product name brand owner is BE International Marketing Sdn Bhd. located in Shah Alam, Selangor. 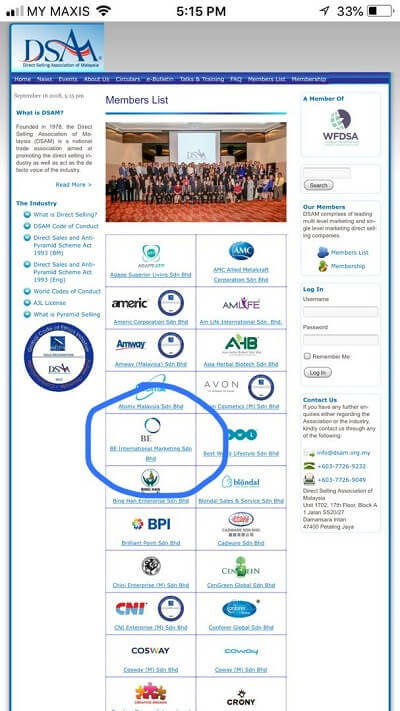 BE International is a registered direct sales company established in 2017. It is also a member of the Direct Sales Association Malaysia (DSAM). As a member of DSAM, you are assured that the company is well capitalised and has a proper business process and structure. The picture below shows BE International, a member of DSAM among all the large direct sales companies in Malaysia. As with all the established direct sales companies in Malaysia, the common business model is the multi-level marketing (MLM) structure. I understand MLM business has a negative reputation in Malaysia, but hear me out. My intention here is not to convince you the viability of a MLM business. The MLM business model works globally and it is already proven to work in Malaysia also. Just look at the largest direct sales company in Malaysia, Amway Malaysia Holdings Berhad. It is a 1st board public listed company in Malaysia. If direct sales / MLM business doesn’t work, Amway would not have been in Malaysia for more than 40 years. How do you make a MLM business model work for you? Firstly, you need to find a product which is unique in the market and has a high repeat sales value. Shiruto from BE International meets both the requirements above. What is so unique about Shiruto? I’ve actually written an article about it and you can read it in the link below. Shiruto being a vitamins for our immune system has a high repeat sales value. I know this is true because I am getting repeat sales of Shiruto from my existing customers. Many of my customers have tried Shiruto and found that it is really effective. Go to Facebook, Google or YouTube and do a search on Shiruto testimony and you will find many people sharing their results online. Now coming back to my initial question of how do you build a home business using Shiruto as your main product? The first step is to try Shiruto yourself so you will know what the product can do for you. Next, you need to understand how the commission and marketing plan of BE International work. Unfortunately, it is quite difficult for me to explain the entire marketing plan here. If you are interested to know more, please click the link below to contact me on WhatsApp and I will share with you.